Terrorists have struck yet again in Jammu and Kashmir. They have attacked two places, inflicting casualties on Army and police personnel, besides killing civilians. The heavily-armed terrorists had apparently been infiltrated through the Indo-Pak border. Why the hurry to protect law-breakers? THE UPA has chosen to side with the convicted MPs and MLAs disregarding public opinion on the issue of criminalisation of politics, that too ahead of the assembly and parliamentary elections. Spirited citizens have spoken vociferously against the government's attempt to scuttle the July 10 Supreme Court judgment, which disqualifies legislators if they are convicted. Lalit Modi was efficient, powerful, arrogant and conceited. Yet, he was loved, fawned upon by those in the Board of Control for Cricket in India (BCCI). This was because he enriched the BCCI like never before; not merely the BCCI the faceless entity, but also hundreds, if not thousands, of people riding the BCCI gravy train. One of them, Ravi Shastri, called him the Moses of Indian cricket. THE memory of the Uttarakhand flood disaster is beginning to fade. But before it becomes just a blur the right lessons must be learnt and false or panic conclusions not be drawn. It was truly a natural disaster aggravated by manmade factors. IN villages, neither Hindus live nor Muslims; deprivation, poverty and haplessness reside here!” said Sir Chhoturam, the Revenue Minister of undivided Punjab. The legend has it that when he was told by Madan Mohan Malviya that his rivals in the Hindu Mahasabha had started calling him ‘Chhotu Khan’ mocking his friendship with leaders like Fazl Hussain and Sir Sikandar Hyaat Khan, his mentoring of Khizr Hyatt Khan and his camaraderie with the poet Allama Iqbal. School textbooks overwhelmingly describe religion as a core set of clearly defined values, traditions and practices which are derived from a sacred text and is deeply embedded with individual's identity. Terrorists have struck yet again in Jammu and Kashmir. They have attacked two places, inflicting casualties on Army and police personnel, besides killing civilians. The heavily-armed terrorists had apparently been infiltrated through the Indo-Pak border. Their killing spree started at Hiranagar police station, a short distance from Jammu, where they shot a guard and then killed the policemen inside the building. They then hijacked a truck and went 20 km to an Army cantonment in Samba district, where too they shot the guard, went to the 16 Cavalry Officers' Mess, and fired at the officers, killing Lieut-Col BJ Singh on the spot, and injuring others. The Army and the police will naturally study how terrorists were able to cause so much damage in such a short while in which is termed as the worst attack in Jammu in over 10 years. People in the region would be concerned and angry, and the knee-jerk reaction over the incident would be to suggest that the proposed meeting between Prime Minister Manmohan Singh and his Pakistani counterpart Nawaz Sharif be cancelled. The two leaders are in the US and are scheduled to meet on Sunday. Prime Minister Manmohan Singh has condemned the attack as "one more in a series of provocations and barbaric actions by the enemies of peace." There is a documented correlation between peace initiatives and aggressive attacks on India by terrorists, and this time there is a strong opinion that the terrorists should not be allowed to set the agenda. Their dastardly attack needs to be dealt with at its own level, even as the diplomatic initiative continues. There is no doubt that the attack in particular and terrorist activities in India by, what some in Pakistan call, non-state actors, will occupy a major part of the talks between the two leaders. Indeed, they should. India and Pakistan both need to communicate in order to find ways and means to defeat terrorism, which is the common menace that threatens peace and prosperity in the region in particular, and the world in general. The court's logic is sound: If a convicted citizen cannot contest elections pending appeal, how can the law be different for a legislator who currently enjoys immunity from disqualification after filing an appeal? Given the work pressure on courts and paucity of staff and infrastructure, it is difficult to bring influential criminals to justice. Cases drag, or are made to drag, and all the while MPs and MLAs enjoys the fruits of high offices they occupy. Even an ordinary employee is suspended when charge-sheeted. The UPA made the first mistake when it decided to amend the Representation of the People's Act under pressure from various quarters. It blundered when it showed indecent haste by issuing an ordinance to achieve the goal that the Bill was supposed to. Media reports suggest the government had ignored expert opinion which pointed out that the ordinance/Bill would be indefensible in the apex court. How can the amended R.P. Act nullify the MPs' constitutional rights to vote in the House and draw salaries/perks as long as they continue in the post? The Association of Democratic Reforms has estimated that 31 per cent of the legislators face criminal cases. It is an affront to democracy and a civilised society that such a large number of people of dubious character should occupy august offices in this country. Most political parties, including the Congress and the BJP, are guilty of fielding tainted candidates. Now when the court has tried to purge the system of at least some of the bad elements, the mainstream political class has agreed to amend the Act through a Bill that has been referred to a parliamentary standing committee. Bickering politicians unite when it suits them. Then, suddenly, Modi’s friends began to desert him — not because of new, sudden revelations of his villainy, but because his power began to wane. Others became more powerful in the BCCI; the hangers-on and the toadies, including our famous cricketer-commentators, found other feet to kiss. Modi had made too many enemies, too. In 2009, his patron in Rajasthan had lost the assembly elections and was ousted from the government. Modi had also angered individuals in the central government and broken foreign exchange rules. Now the BCCI has banned Modi for life. It’s incredible. There is no doubt Modi broke rules, arrogated power to himself and ran the IPL like his fiefdom. Yet, the BCCI can't absolve itself of its share of blame in Modi's misdeeds. The man who presided over Modi's sacking, BCCI president N Srinivasan, has a serious conflict of interest because he also owns an IPL team. That team's principal, Srinivasan's son-in-law, is charged with betting in the IPL. There's even a suspicion of match-fixing by Srinivasan's team. The captain of that team is MS Dhoni. Yet, Srinivasan is hanging on to his post and says he'll contest elections for another term. This makes it clear that Modi was banned not to cleanse Indian cricket; he was banned because he had lost all friends in the BCCI. People who punished him are no different than him. The coincidence of two atmospheric events focussed around the Kedarnath region caused a huge cloudburst bringing down over 330 mm of rainfall in a narrow Bhagirathi catchment. This, with preceding snowfall, caused the glacial lake west of the Kedarnath shrine to burst and the adjacent Chorabari Lake (or Gandhi Sagar) to its east, to overflow, causing a huge cascade of water and moraine to thunder down in a flood of immense intensity that swept everything before it. The structures flanking the gorge at the river's edge and flood plain undercut the saturated banks with an erosive fury that brought buildings and roads crashing down, a drama witnessed by millions on television screens. This was the prime location of the disaster though adjacent valleys were not spared similar punishment. No dams or run-of-river hydro projects, complete or under construction, no industry or mine, nor reservoir induced seismicity was responsible. Deforestation played little or no role, nor the substitution of pine for oak as the disaster-formation area above Kedarnath was mainly beyond the tree line. And were it not for the Tehri dam, which had a large flood cushion early in the monsoon season, the lower Bhagirathi and Ganga below Dev Prayag would have been devastated. So much for the myths! The bar on sand mining may, however, have contributed to clogging the flood path of the river in critical patches, causing huge moraine boulders to chisel and hollow the hill side. The manmade factors include unsustainable growth around ever-increasing religious tourism to the fragile "char dhams". For example, the number of pilgrims visiting Kedarnath rose to some 12,000 a day against a carrying capacity of perhaps a tenth of that figure. According to one estimate, the numbers visiting the char dhams rose to 1.3 million in a month. This unregulated surge has been commercially fostered over the years by reckless yatri promoters, resulting in unplanned urbanisation with multi-level structures wrongly sited, poorly aligned roads, thoughtless road widening, an increasing rush of pony/mule, palki, taxi and bus operators with wholly inadequate supporting services like water supply and sanitation or waste disposal or any hazard or vulnerability mapping, design certification or evacuation plan. Meteorological observation stations were few. A sanctioned Doppler radar system (limited though its utility might have been in terms of warning time) was not installed, and the Disaster Management Authority, both at the State and Central levels, was caught unprepared and not meshed into the system. The glacial lakes were not seasonally monitored or punctured if necessary and burst and overflowed without warning. The Army and the Air Force conducted the most arduous and heroic search, rescue and supply operations, air-dropped food packets and rendered timely medical aid, relief and rehabilitation. What is required now is a comprehensive disaster management plan in three phases: pre-disaster, R&R, and post-disaster. The entire region is located in seismic zones IV and V but the dam structures have been designed to withstand expected levels of shaking and floods with added safety margins. But all other buildings and structures must be similarly designed and retrofitted and roads remodelled and buttressed to prevent toe erosion by swirling rivers and slope failure. Some water projects under construction have dumped spoils and muck into the river. This is bad practice and rivers must be dredged to remove such obstructions and proper dumping sites provided for future disposal of spoils. There will be a natural tendency to rebuild housing and other structure as before. This must be resisted as far as possible by providing temporary shelters for the forthcoming winter and preparing plans for newly designed urban facilities constructed to a better design for living. Industries have been licensed at lower altitudes and are generating employment and must be encouraged to create more jobs. The present pattern of farming is unsustainable. Uttrakhand must follow Himachal in switching over to hill farming based on horticulture, vegetable cultivation, floriculture and herbiculture, with food security ensured from the plains. Hydro power will provide the means of constructing a series of cold chains and first-stage processing units with ropeways and roads to bring down produce to larger processing hubs and mandis with refrigerated storage and market linkages. Religious tourism must be regulated by rationing accommodation and transport capacity, and the yatri season defined to minimise natural hazards. Eco-tourism must be fostered elsewhere in the lovely mountains with log cabins, treks, white water rafting, angling, bird watching and the like. The retardation or banning of hydro-projects as a knee-jerk reaction would be retrograde. They did not cause the 2013 disaster. Problems of fragmentation of the rivers by successive run-of river projects can be avoided and minimum eco-flows of 10 per cent or more mandated. Fish ladders and fish ponds can be ensured and one per cent of the royalty being paid to projects must be devoted to local development. These apart, hydro projects may be required to contribute a certain fraction of their earnings for corporate social responsibility programmes designed and managed with stakeholder participation. Locals mostly want hydro development. It is the outsiders who object. A study on the Cumulative Impact of Hydro Projects in the Alaknanda and Bhagirathi Basins up to Dev Prayag, conducted by the Alternate Hydro Energy Centre, IIT, Roorkee, December 2011, by and large exonerated the current projects, commissioned or under construction, as having had a manifestly negative cumulative impact with regard to hydrology, river ecology, floods, glaciers, seismicity sedimentation, forests, bio-diversity, wild life and fish, religious tourism and livelihoods. Some negative features have been mentioned and corrective steps enumerated. Trees are lost in land diverted for hydro projects and appurtenant works. In the case of 14 NHPC projects, commissioned or under construction across the Himalaya, 101,781 trees were lost by diversion of 2734 ha of land. But compensatory afforestation has covered 4334 ha of degraded or non-forest land and some 930,000 trees planted on them. In the case of the Dhauliganga project, the ratio of trees lost to trees planted was over 1:40, catchment area development bringing additional ecological benefits. Over space and time ecological losses are generally more than compensated by far. The Roorkee IIT report has been critiqued by the Wild Life Institute of India, 2012 and certain other scholars but much of that criticism has been rebutted by the Institute A Bhagirathi-Bhilangna Basin Authority was set up a decade ago but remains dormant. A larger Ganga Basin authority up to Hardiwar and a Himalayan Commission have been advocated. These are worthy of consideration. As also climate change cooperation with ICIMOD, Nepal, Bhutan, Pakistan, Bangladesh and China. Promptly, he replied, “I make policies to uplift the farmer and free the villages of poverty, let them call me whatever they will”. To the farmers, he said, “The day the urbanites stop calling me names, consider your Chhoturam dead and the more names they call me, the better work I am doing for the villages of Punjab”. Such statesmen are rarely found today. For Sir Chhoturam “pre-occupation with religious rituals was an urban pretension” and though he was not an atheist, he believed in the Marxist axiom that “religion is the opium of the masses”. His alternative was clear; he was of the firm belief that “Bina arth ke rajniti nir-arthak hai!” (Politics without sound economics is meaningless) — the import of this philosophy was perceptible in policies framed under the provincial diarchy. During the Second World War black-marketing became rife; to curb it the Viceroy called a meeting of representative ministers from various agricultural states for a discussion on price regulation. It was emphasised that wheat would be sold for Rs 6 per tonne. Everyone was in agreement, except the Punjab representative who was adamant that the grain would not be sold for less than Rs 10 a tonne. The Viceroy was not amused, “Do you know even a thing about economics?” asked the irate Viceroy. “My economics is drawn from the book of life” shot back an equally angry Chhoturam. "Punjab is the only state that produces wheat; the ministers who agree to the proposed price represent states that buy/consume wheat; not a single minister on this table represents a wheat-producing state. My lord, you know nothing of a farmer’s investment in the field and decide things on his behalf. I assure you that the farmer of Punjab will like to burn his produce than sell it at such an outrageous price," he had to walk out of the hall after he issued this warning. har shakh-e-gundum ko jala do! (A field from which a farmer cannot get to eat, burn every ear of the corn in that field). The displeased Viceroy quizzed Premier Hyatt Khan on the choice of the representative but Hyatt Khan was sure that Sir Chhoturam was the man for the moment. The Viceroy understood the popularity of this leader in Punjab and gracefully yielded, declaring Rs 11 as the price for wheat grain. “If religion was the correct premise of a political state, all states following the same religion would be one but it is not so, thus rubbishing the hypothesis that religion can be the foundation of a state”. This was the rationale put forth by Sir Chhoturam against the politics of religion at a convocation organised by the Muslim League in the 1940s. Jinnah never forgave Sir Sikandar Hyaat Khan for sending Sir Chhoturam as his nominee to this conference. Hindu, Muslim and Sikh Jats — all farmers — found a common leader in him. His agenda was development and his vote bank was safe as long as he lived. The latest communal flare-up in Uttar Pradesh is a challenge to the people and they must rise to the occasion, putting up a common front against the communal forces. Sir Chhoturam is dear to the villagers, though he has been ignored by the mainstream history. If he is a household name in Haryana, he has been an icon in UP as well. I find this idea of religion and its implication for students static, who have a lived environment where religious beliefs are quite diverse. Besides, religions transform over a period of time, a change that can only be discernible through historical lens. There, thus exists a strange dichotomy between pedagogical engagement with the idea of religion in classrooms and its relationship with the realm of people's beliefs and practices. Academic debates on religious practices in pre-colonial and colonial Punjab are similarly heavily inclined towards making us believe that Punjab had three major religious traditions — Islam, Hinduism and Sikhism — with exclusive and separate ideas of belief, divinity and piety. What the movement for social reform and revivalism invented in colonial India, was an idea of a neatly defined boundaries of religion, often paradoxically articulated in the very language that the reformers wanted to critique. Attempts were made to 'cleanse' the notion of identity and dissuade Hindus, Muslims and Sikhs from venerating shrines associated with each other. Further, academic debates try to erroneously project that while in pre-colonial Punjab Islam was in conflict with Hinduism and Sikhism, in colonial scenario all of them embroiled in a competitive movement for reform and revivalism. Instances of cross-religious interaction are predominantly projected as either competitiveness or possessiveness with one's identity. I try to argue the contrary and propose that it is important to approach and communicate ideas of religion and belief practices as 'connected and processoral'. This implies that religions and identity always remain in a state of flux and lived religion is far more diverse than textual religion. Thus, while religious practices remain connected either critically or organically to early forms of belief systems, they also keep re-shaping in newer socio-political environments. With this argument in mind, I try to approach the nature of popular religion and Sufi shrines in pre-partition and contemporary (east) Punjab. Punjab was one of the earliest provinces to receive the influence of early Sufi mystics in Medieval India, over the centuries Sufi thought became an integral part of Punjabi identity. It is significant to note here the early contribution of Baba Farid to the growth and development of Punjabi literature. Sufi thought and its relationship with Punjabi identity had thus taken strong roots even before the rise of Sikhism. This relationship revolved around vast network of sacred shrines (dargahs and khanqahs) and everyday practices in the urban and rural landscape of Punjab. Most shrines in the rural landscape were rudimentary structures and did not adhere to any imperial forms of art. Nath Panth was another major religious influence on the landscape of Medieval Punjab. Primarily an order of ascetics, Nath saints were known with several names Nath jogis, Kanphata yogis and Siddha yogis, but best remembered for Baba Gorakhnath. Major shrines associated with Naths were spread across Punjab from Tilla Jogian of Gorakhnath in Jhelum district of (now) Pakistan to Jalandhar Nath in Jalandhar district of Indian Punjab and Mast Nath at Asthal Bohar in Rohtak District of Haryana. One of the major contributions of Naths was Hatha Yoga and associated practices of breath control which influenced contemporaries like Baba Farid. Predominantly Shaivite, their critique of caste and practice of monotheism predated the birth of Guru Nanak Dev. With the strengthening of Sufism and Sikhism in the latter part of the medieval Punjab, Nath core principles of monotheism, yoga and critique of caste were assimilated into their fold. It is pertinent to note that the practice of maintaining a hearth (dhuna) with trident along with Shia panjtan pak (an open hand representing Prophet Muhammad, Ali, Fatima, Hassan and Hussain) survives in the Sufi shrines of contemporary Punjab. The rise of Guru Nanak Dev was a synthesis of social critiques of those times. Institutionalisation of a religion based on monotheism (common to Sufism, Nath Panth and bhaktas like Kabir), langar tradition (which was in practice at the khanqah of Baba Farid), critique of caste and a religion of the householder was one of the remarkable contributions of Baba Nanak. The evolution of Sikhism presents the best example of a religion which was 'connected and processoral'. Baba Nanak's association with Mirasis, the compilation of Adi Granth and establishment of Harmandir are best examples of connectedness with the social space. Even at times of crisis with the Mughal state, Sikh practices continued to be organically linked to the social landscape. For centuries before the British arrived, religion in Punjab was thus a cauldron of both political debates viz-a-viz the Mughal state and yet an organic synthesis of ever-evolving meaning of religion and religious identity. One significant example of this evolution can be found in the continuous rendition of the qissa of Hir-Ranjha from Damodar (Hindu) in the early seventeenth century to Hafiz Shah Jahan Maqbul and Waris Shah (Muslim) in the eighteenth century, and Kishan Singh Arif (Sikh) in the late nineteenth century. While these texts critique the creed of orthodoxy, their major sources of piety and spiritual strength were almost always jogis and pirs. Besides, despite being a story of 'Muslim' lovers, it finds tremendous resonance in the contemporary Punjabi identity. These popular narratives exemplify the role that shrines and popular mystics played in the lived lives of Punjabis. Hir Waris continues to be the guiding Sufi text of social critique and constitutes an important social text on the veneration of Sufi saints. Partition of Punjab in 1947 reduced east Punjab to a Sikh and Hindu majority state. For more than a decade after Partition, many of the popular Sufi shrines in the region continued to remain desolate. However, dreams, memories and oral narratives of pre-Partition Punjab travelled along with people who migrated from west Punjab and despite competitive narratives of war, nationalism and militancy, survived in the popular landscape of Punjab. After a brief lull many older shrines managed earlier by the Muslims were taken over by non-Muslims, though the ones earlier managed by non-Muslims continued. Saint veneration re-emerged as a complex web of several lineages drawing inspiration from Chishti saints like Sheikh Muinuddin (Ajmer) and Baba Farid (Pakpattan) to Chishti Sabri saint Sabir Pak (Kaliyar), from memories of Qadiri saint Abdul Qadir Jilani of Baghdad (popularly known as Gaus Pak), veneration of Sheikh Haider (Suhrawardi saint of Malerkotla) and Baba Lakhdata (popularised through Chishti Sabri network of local lineages). Besides, shrines dedicated to local saints are located across the rural and urban landscape of contemporary Punjab. The new custodians sought legitimacy to control these shrines through memories of their links with Sufi shrines and centres located now in Pakistan. However, the local landscape was not bereft of the tales of their own. One of the most vibrant among these narratives revolves around the persona of the tenth Sikh Guru at the shrine of Pir Bhikham Shah, a Chishti-Sabri saint at Ghuram Sharif in Patiala. The legend narrates that when Guru Gobind Singh was born in the east of India at Patna, the saint offered sajda (prayers) facing towards that direction. When questioned about the same by his murids he told them that he has dreamt of a new sun rising with the advent of baby Gobind Rai. Bhikham Shah and his disciples travelled all the way to Patna (Bihar) to have a glimpse of the infant Gobind Rai, apparently then barely three months old. Desiring to know what his attitude would be towards the two major religious traditions of India, the saint placed two small pots of sweets in front of the child, one representing Hindus and the other Muslims. As the child covered both the pots simultaneously with his tiny hands, Bhikham Shah felt happy concluding that the new seer would treat both Hindus and Muslims alike and would show equal respect to them. Another such narrative is related to Nawab Sher Muhammad Khan of Malerkotla. When Wazir Khan captured the two sons of the tenth Guru and ordered their execution, the Nawab wrote a letter to the Mughal emperor Aurangzeb, protesting against the order to prosecute the innocent children of the Guru. This gesture made the Nawab and the shrine of the patron saint of Malerkotla, Haider Shaikh very popular among Hindus and Sikhs of the Malwa region. Every year thousands of people visit the shrine of Malerkotla to pay their homage to the patron saint. Similarly, shrines associated with Sakhi Sarwar (popularly known as Baba Lakhdata) are scattered across the landscape of Punjab. Urs and qawwali darbars organised at these shrines are embedded in the vibrant space of social critique. 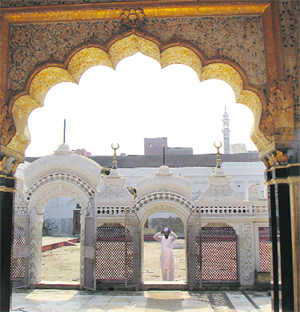 Private shrines known as Pirkhanas are significant source of veneration for Aggrawal sabhas in south Punjab. Most of these shrines have been established in the first decade of the twenty first century and draw patronage from a wide spectrum of individuals. There is a wide circulation of audio and visual material focusing on qawwalis, qisse and hagiographies narrativising these shrines. While many shrines draw a pattern of spiritual lineage, most others have a localised significance; for instance, the shrine of Sher Shah Wali at Ferozepur, or a new set of sajjada nishins and intermediaries like Baba Gope Shah at Amritsar and Ghulam Farid Chishti at Makhu. One very significant element of Punjabi cultural ethos is the acculturative element of its religious traditions. Chishti Sabiri shrines usually maintain a dhuna (hearth) reminding us of the close links between the Naths and Sufis in the medieval India. Even non-Muslims participating in the Urs (fair) wear skullcaps. Shrines like those of Baba Murad Shah at Nakodar have influenced contemporary musicians like Gurdas Mann and Hans Raj Hans. Many of these shrines are memorial shrines erected after burying sand collected from the parent shrine associated with a Sufi mystic. Dreams are also a potent tool for reclaiming a popular memory of Hindu and Sikh veneration of Sufis and their shrines. One of the key elements of these narratives is that they appropriate and interweave the medieval liberal and critical discourse of the Nath, Bhakti, and Sufi traditions and emphasise the continued relevance of these articulations in the contemporary society. The relevance of these debates is also specific to space. In the wake of 9/11 there has been a spate in the incidence of hate-crimes against Sikhs in the West, primarily because of similarities in their physical identity with the Muslims. Sikh organisations have sought to counter this with campaigns to educate people in the West about the dissimilarities between the Sikhs and the Muslims and emphasising upon the uniqueness of Sikhism. There is thus a paradoxical engagement with issues of identity in a transnational context. Yogesh Snehi teaches history at the School of Liberal Studies, Ambedkar University, Delhi. Views expressed are personal.